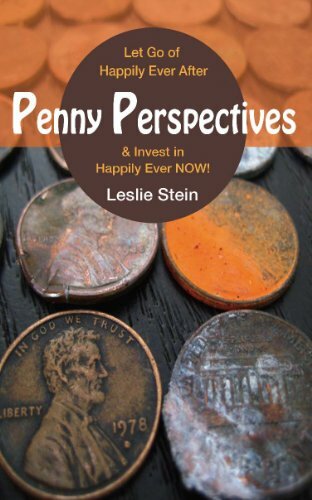 Leslie Stein is the author of Penny Perspectives: Let Go Of Happily Ever After and Invest in Happily Ever Now!. She is a writer, speaker, and founder of The Penny Project. She has worked in sales, project management, and coaching. Q: How did you come up with the idea for the Penny Project and for your book? A: The introduction to the book talks about finding a $20 bill in the street. It got me curious about how much I could find in a year. I decided to do it for a year, and as the year went on, people got involved, and over the course of the year I found more than $30. [I had wondered,] If I found little things, would I find as much [overall] as a $20 bill? And other people chipped in. At the end of the year, I thought I would donate the money. People said, you can’t stop! It’s too much fun! Carry on! On we went with year two. A couple hundred dollars were found, and it picked up a life of its own. At the 2 ½ year mark, I had collected $500. Q: What impact has it had on your own life? A: I just got off the phone with my sister. She had a question—she asked the universe for a sign, and she saw a penny, and knew [she was] on the right track. People are really involved with the project—I’ll hear about that. I still have people posting funny things about pennies on my Facebook wall. For me, the most lasting impact, because of the initial question, could I equal the big find by paying attention to little things, not only could I but it was 50 percent more! I see the value of paying attention to the little things in life. It taught me to be happier overall. The title “happily ever now”—you don’t need big finds to be happy. Q: Are you still working on the project now? A: I do it more loosely now. I was like a crazy person the first three years. I do still keep a spreadsheet, and people bring me money. I still have $1,500 in the account. I donate in small increments like $200, and I’m looking for the right fit. Usually about once a year I give to people. Q: What has been the reaction to the book from readers, and what do you hope they take away from it? A: Some of my favorite reactions are from parents who share the stories with kids. I’m a new mom, she’s five months old. To think the stories can have value for older kids [is good]. People say it feels like having a conversation with you—you write how you speak. I hope people who don’t know me find it conversational. A: I love Elizabeth Gilbert. She’s one of my favorites. One of my favorite books is Bill Bryson’s I’m a Stranger Here Myself. It makes me laugh so hard. I bought it on a trip with my family, and read it out loud, and we were all laughing. Paulo Coelho’s The Alchemist—I love his books, and I’ve read most of them. The Witch of Portobello—I couldn’t put it down. Each one is very different. A: Mostly I’m working on understanding how to be a mom. As far as passion projects, a couple of years ago I did a project, Soul Notes. I was single and wanted to find the right person. A mentor said, Do you want to know what I did? I created a ritual for myself. I made my bedroom a place no lover could resist. I made it beautiful. I did that every day for a year. I would slide the note under the pillow on the other side of the bed. At the end of the year, I decided to write to my own soul for a year. I stopped in June 2012, and in July, I met the man who would become my husband. I shared the notes with him on our first date. It’s amazing I got to go on a second date! I’m thinking of writing an introduction, how they worked for me as a gratitude project. Like the Penny Project, it’s finding [meaning] in little things. People say it happens when you’re not looking. By the end, everything seemed awesome, and that’s when I met my husband. A: The only thing both projects have in common—I listened to the podcast Earn Your Happy, by Lori Harder, and it asks the question how would you explain how to be happy? The conclusion I come to is it’s a way to be wildly grateful for the things you have right now. I did not think when I picked up that $20 that so much would come out of that. I was drawing pictures every night, and now I’m married to an artist. It came from being grateful for what you have right now. It was the gratitude that attracted the good stuff.